From Russia with Love, Foreign Visitors Send Home Picture Postcards, 1896-1949. Although this is a picture postcard exhibit, it incorporates a considerable amount of social philately and postal history. It traces the history of PPC use in Russia from its very beginnings up to shortly after WWII, the people who sent them and the various reasons for which the cards were sent. It specifically excludes exchange-club correspondence, as well as cards with messages in Russian and Esperanto. Frame 1: Postcard from Novorossiisk to Egypt franked with Egyptian postage due stamps only (1901). Frame 3: Postcard from Delizhan to Turkey delivered by ROPiT (1907). Frame 5: Postcard from Moscow to Tuscola, Illinois with both sender and recipient identified (1912). 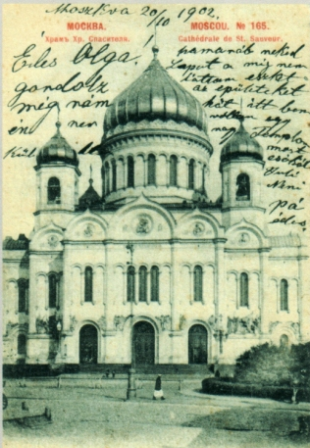 Frame 6: Postcard sent by an American consul from N. Novgorod (1916). Frame 7: Postcard sent from Moscow to Germany during the inflation period (1923); Postcard delivered to Cleveland by domestic USPS service franked with a Soviet stamp only (1923). Frame 8: Diplomatic mail from British Embassy (1944); Diplomatic mail from American Embassy (1948).